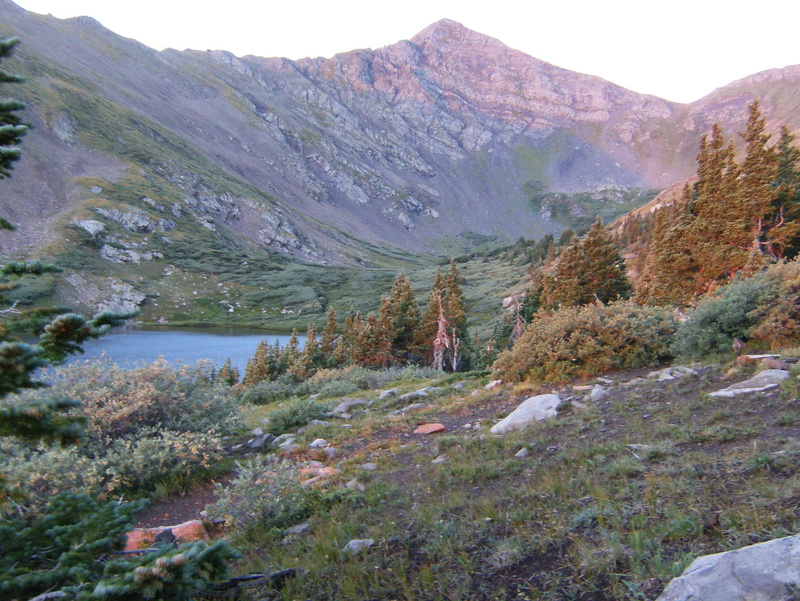 My second trip to Colorado in the last month, and my first backpacking trip in the Rocky Mountains. 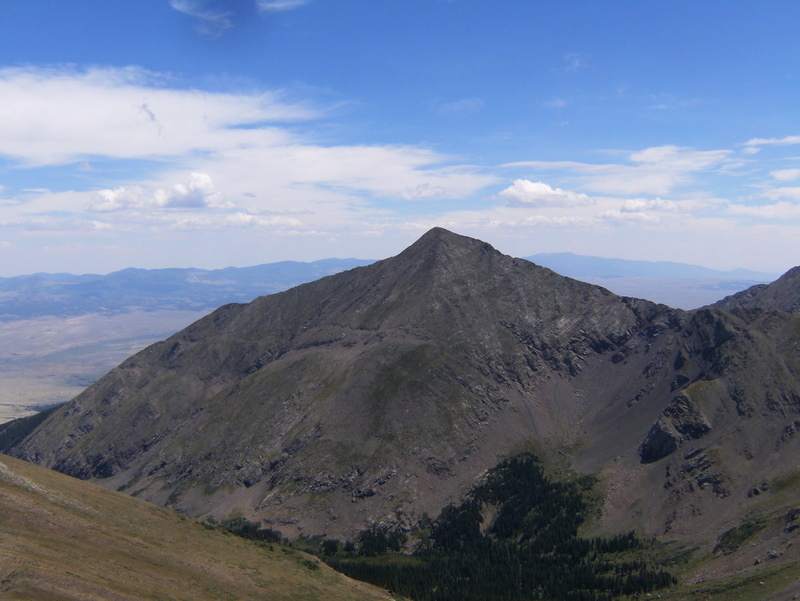 The destination was the Comanche and Venable peaks of the Sangre De Cristo range southwest of Westcliffe. 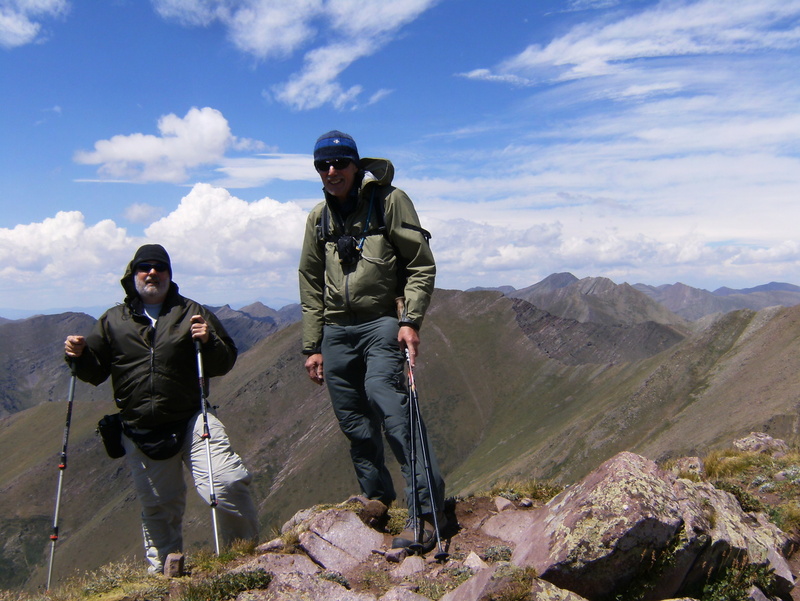 I went with a friend who has made many trips to Colorado (including climbing quite a few 14ers) over 20+ years and who also did the Ouachita New Year’s trip with me. 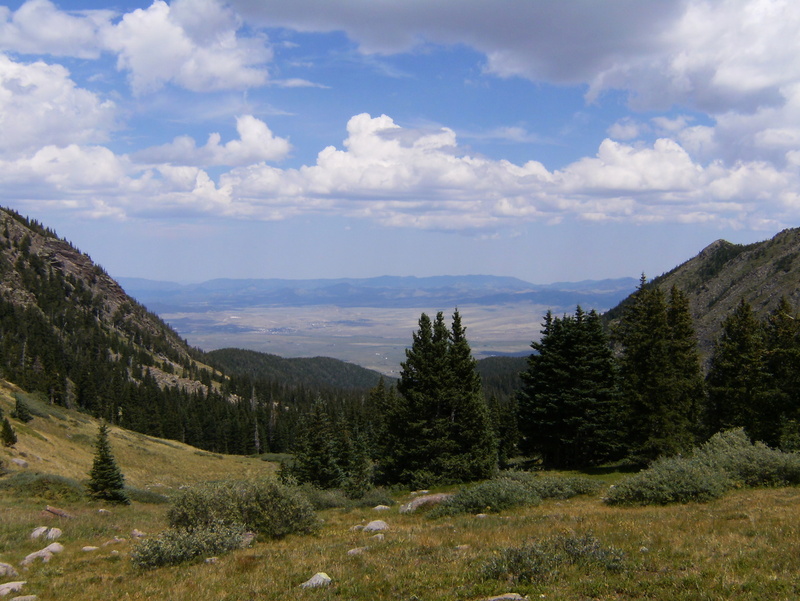 A popular day hike in the area is to go up the Venable Trail, across the Phantom Terrace and the west face of Spring Mountain, then down the Comanche Trail. We weren’t doing exactly that but would see much of the same scenery. The reflection of the mountains is a nice unintentional effect here. On the way through Colorado Springs Thursday (Aug 9) we stopped at REI to look around, and of course I didn’t leave empty-handed. It was my first visit to one of their retail stores and I eagerly await the opening of the KC store next year. On the way out of town, we came across a motorcycle accident right after it happened on I-25. The rider was laying in the highway and the bike was further down on the shoulder. Several people had stopped to attend to the rider and try to keep him from moving. I’m sure that messed-up traffic for a while. 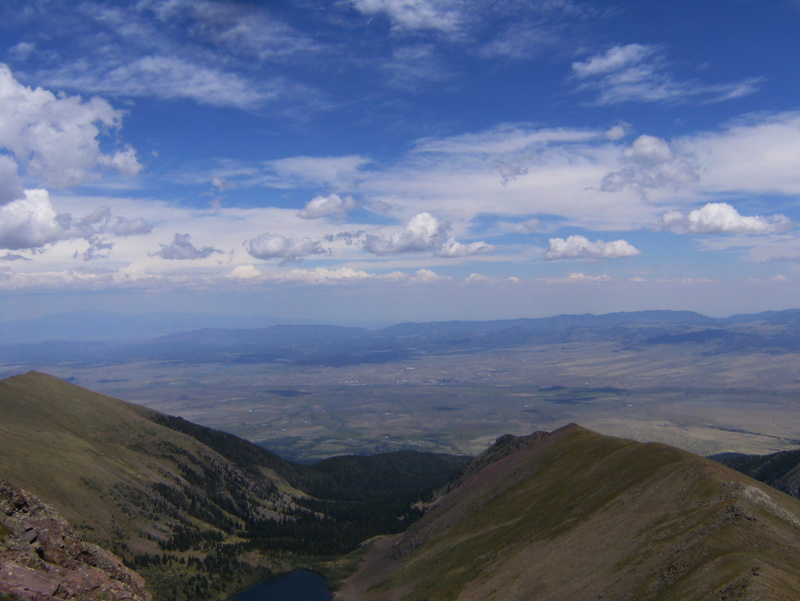 Early Thursday afternoon we arrived at the Alvarado campground southwest of Westcliffe with the intention of spending one night there before backpacking into the wilderness area in the mountains above. 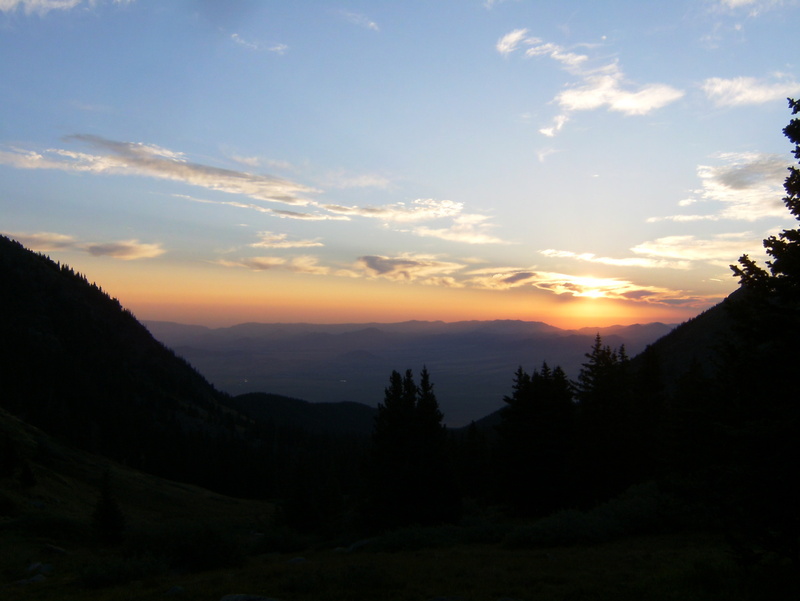 The campground is at the foot of the mountains at about 9200′ and has a great view of the valley about 1200′ below and the Wet Mountains range to the east. You’ll see many pictures of that view. 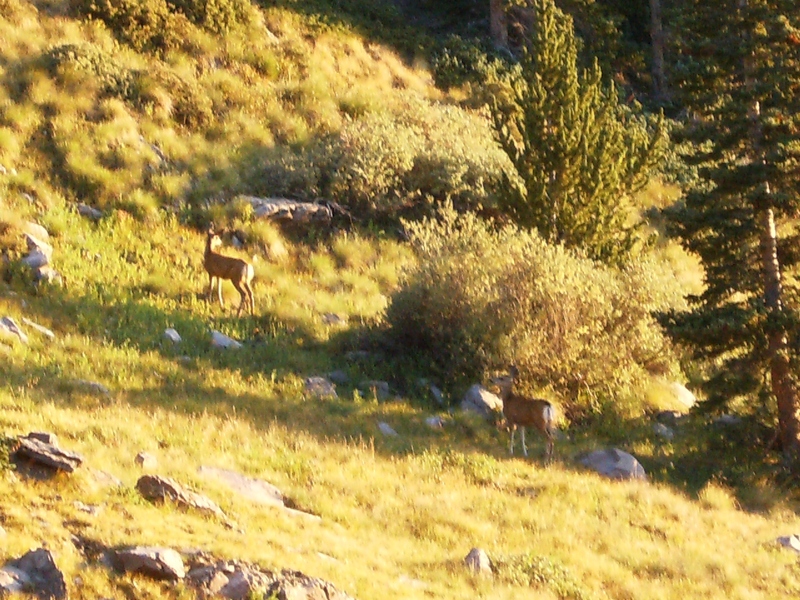 The campground host said he chased-off some bears a couple days earlier. 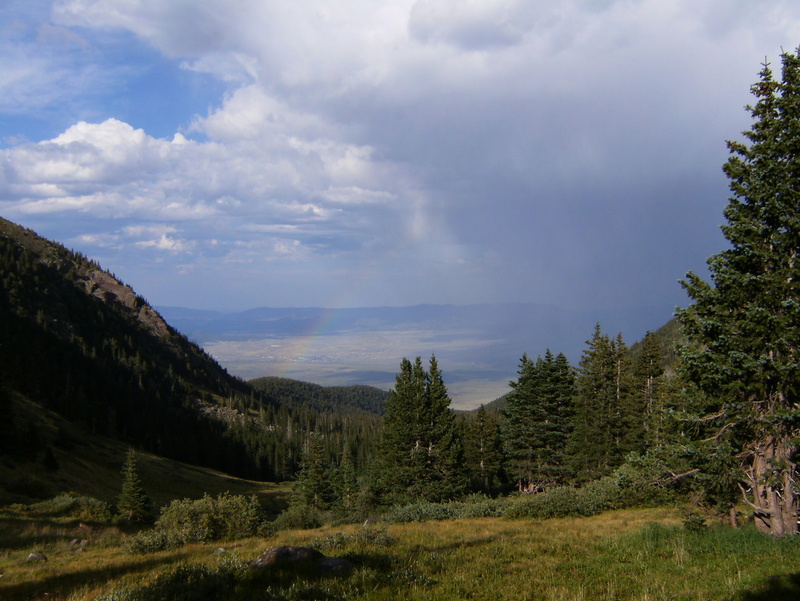 After setting-up camp we started out on a short hike to Venable Falls but got stopped by a late-afternoon thunderstorm. This was to become a familiar pattern. 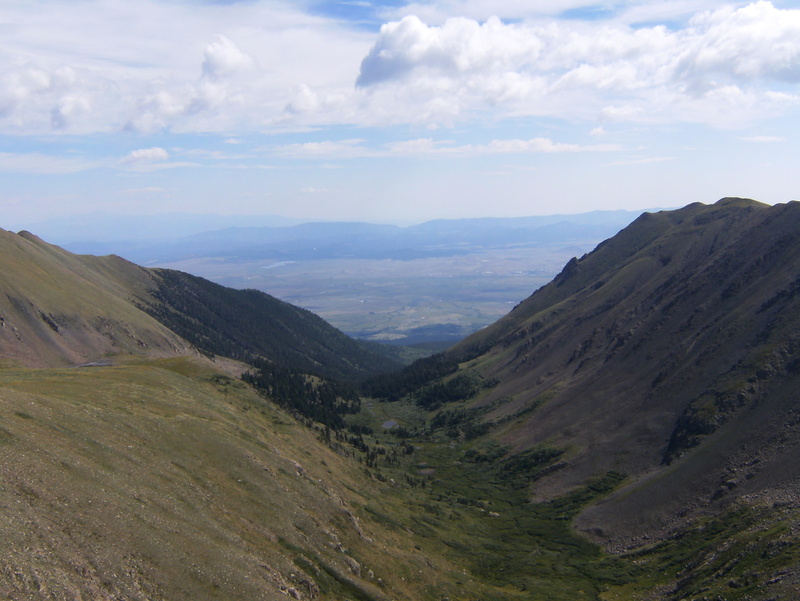 After retreating, we drove to Westcliffe to see what was going on there and in neighboring Silver Cliff and to enjoy a non-freeze-dried meal. 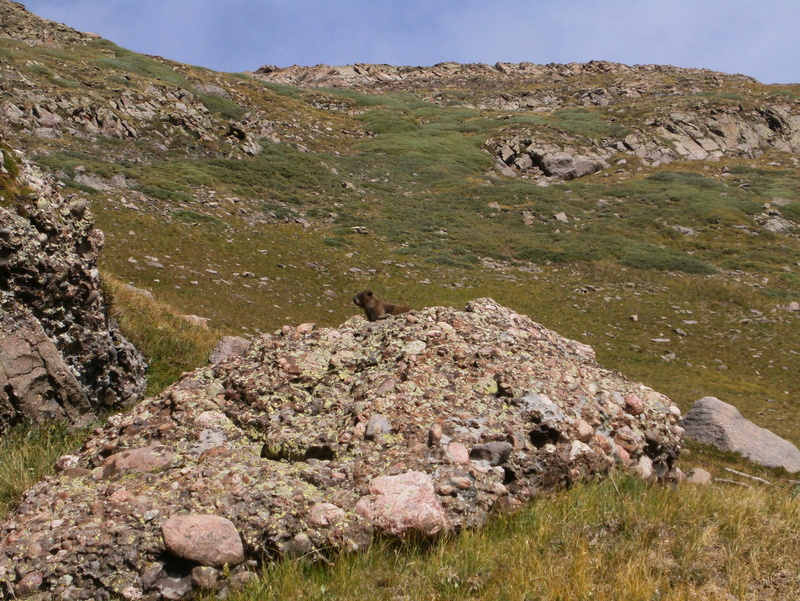 Not far outside the campground, we saw a small bear at the edge of the road. 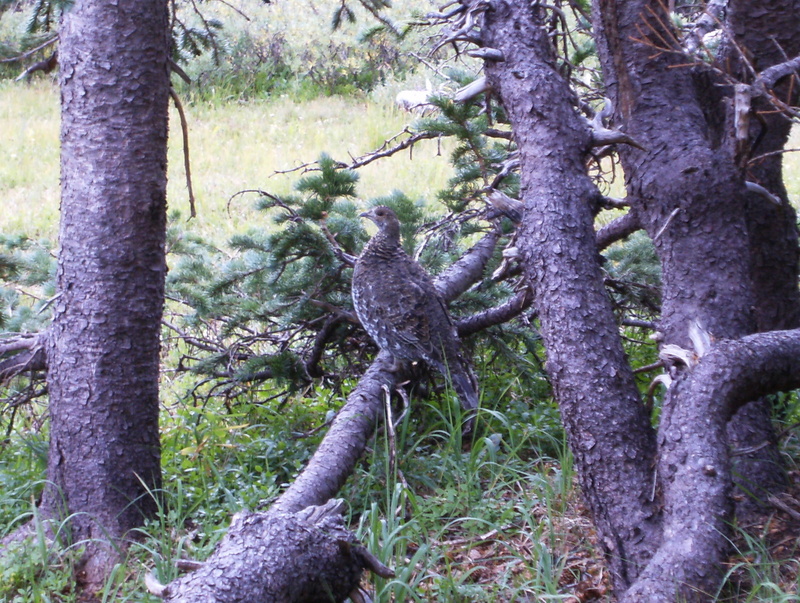 It ran off into the brush and then stood up to watch us. I scrambled to find the camera and get a picture but the bear didn’t wait long enough. After dinner at R’s Pizza in Silver Cliff we went back to camp. 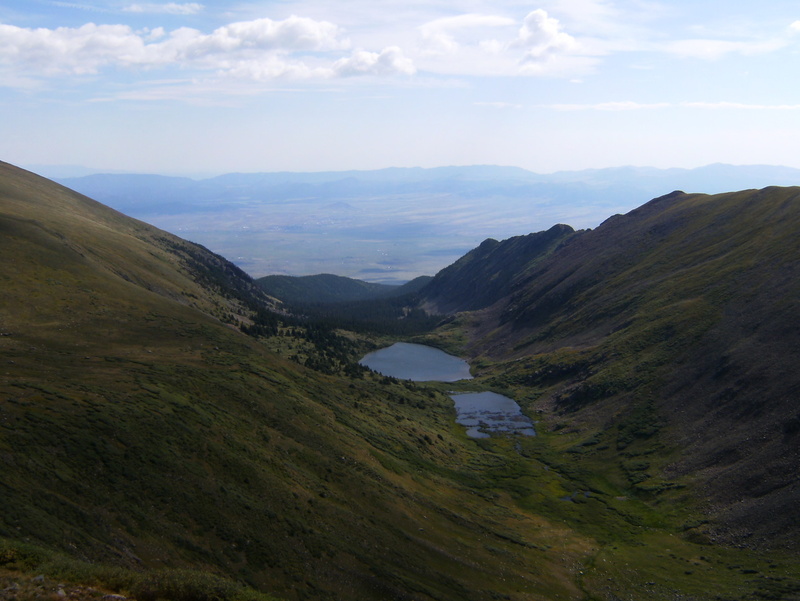 Friday morning we packed and drove to the Comanche-Venable trail head and began our trek to Comanche Lake about 5.5 miles in and 2400′ feet up. 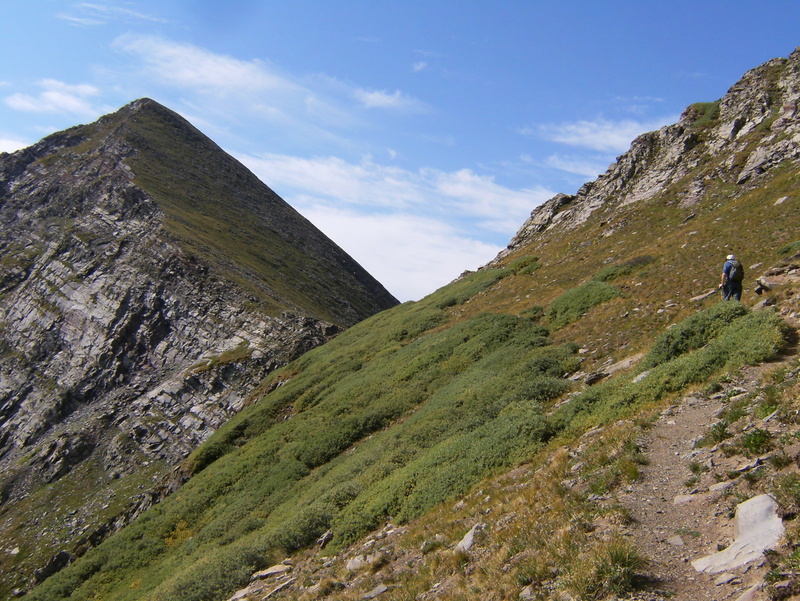 The trail soon enters an area that is almost all small aspens but then you begin a long series of switchbacks through tall pine/fir. It has a primeval look and feel. 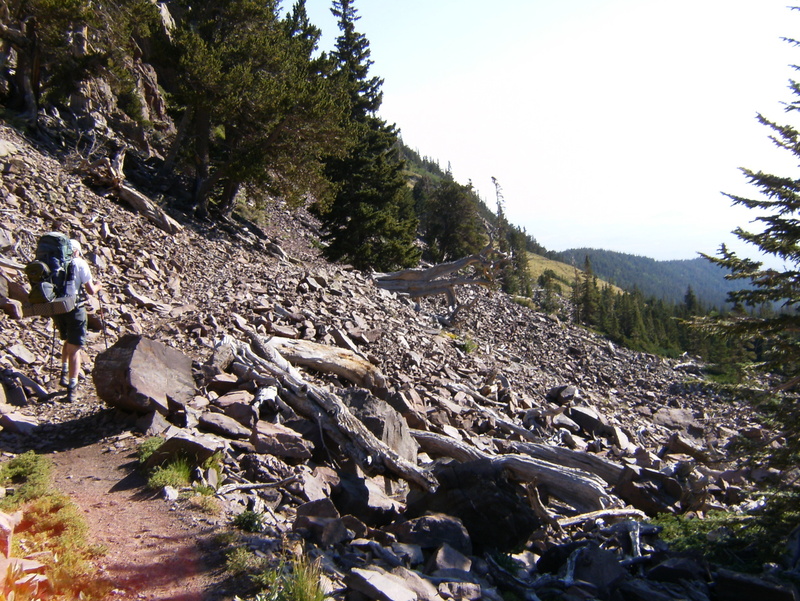 The trees thin after that, and boulder fields become more common. 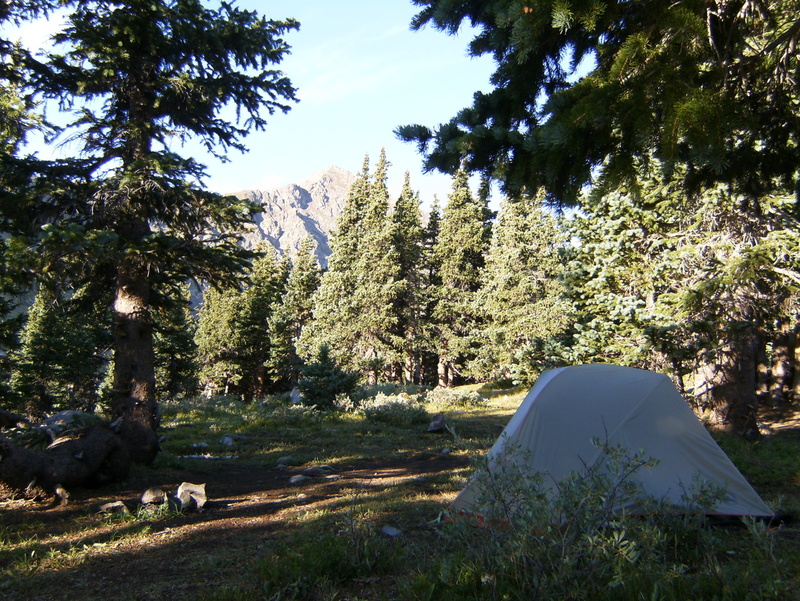 We set up camp in a heavily-used area on a shelf north of the lake and the trail while the clouds darkened above. 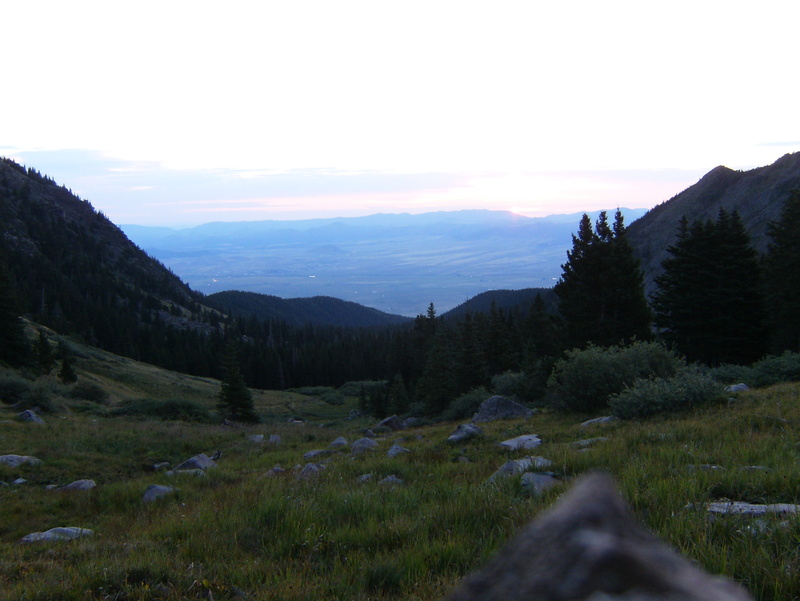 We had pretty much the same valley view as the night before, but from a higher elevation. We went down to the lake to get water but shortly after returning, the wind came up and it started raining and hailing off and on for several hours. 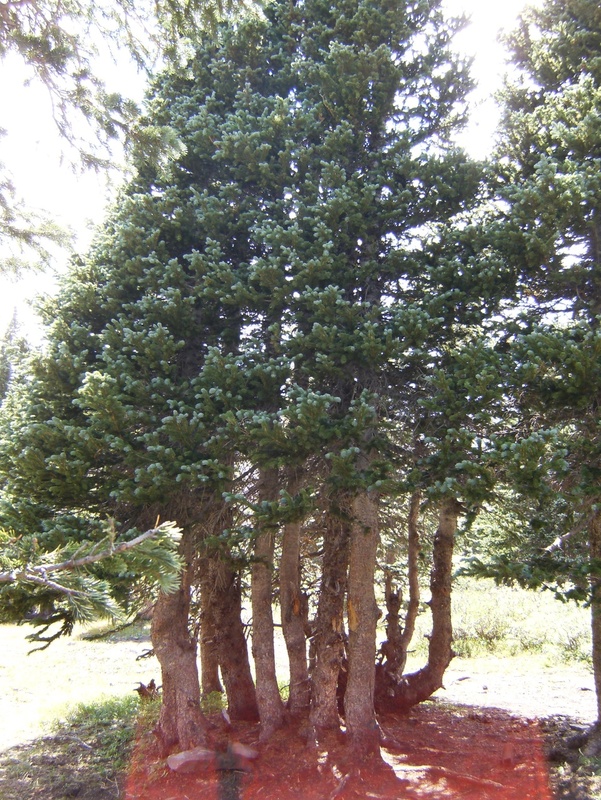 The pine trees grew in these interesting clusters and we found pretty effective shelter in the midst of such a cluster. Temperatures overnight fell into the low 40’s so the fleece jacket, cap and gloves were all put to use. Saturday was the big day. 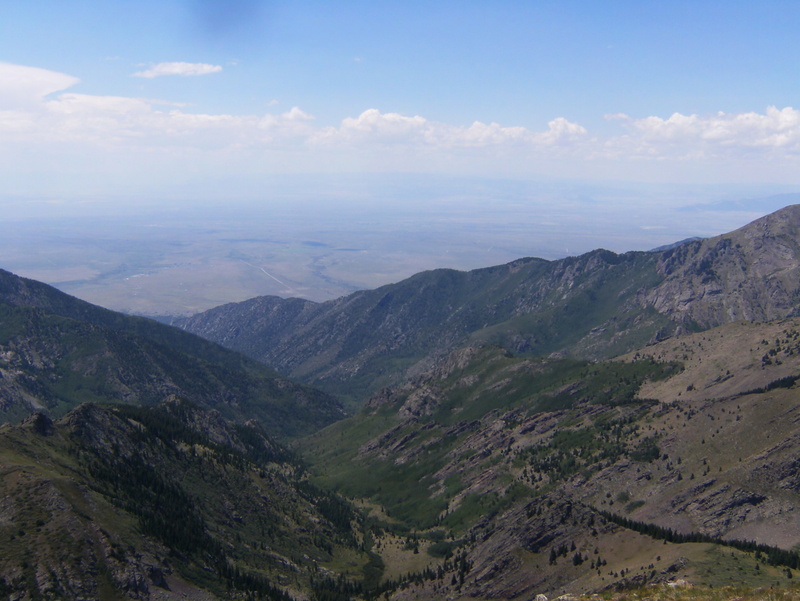 We hiked up to the saddle below Comanche Peak and over onto the trail that runs north along the west face of Spring Mountain to the saddle below Venable Peak, then back over to the east side onto the Phantom Terrace where things got really interesting. 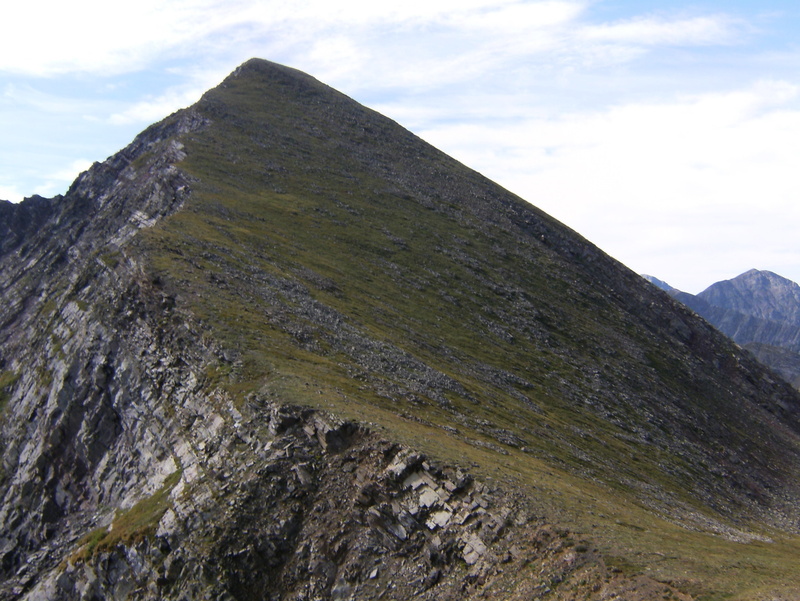 There are several places where a misstep means a 1000 foot fall. I wonder if SPOT would survive that? 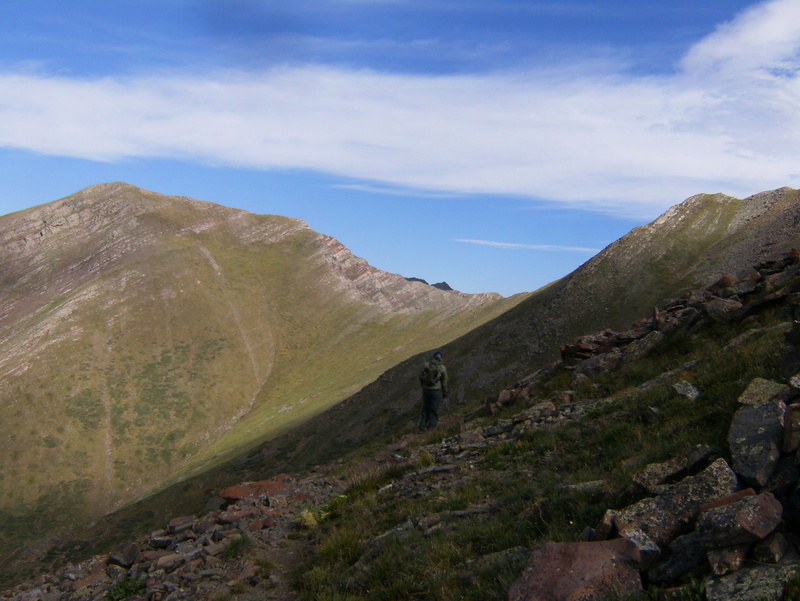 We didn’t go all the way to the Venable trail – we turned back after the Phantom Terrace became less interesting. 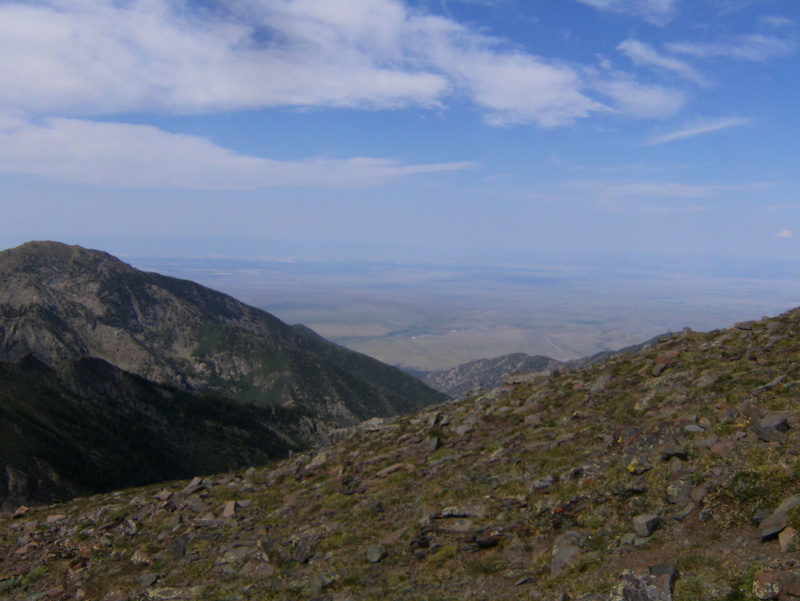 We debated climbing Venable but decided doing so might leave us vulnerable to the usual afternoon thunderstorm so it was best to go back to Comanche Peak where we would be closer to shelter. The wind on the west side of the range was unbelievable and nearly blew me off my feet a couple times. 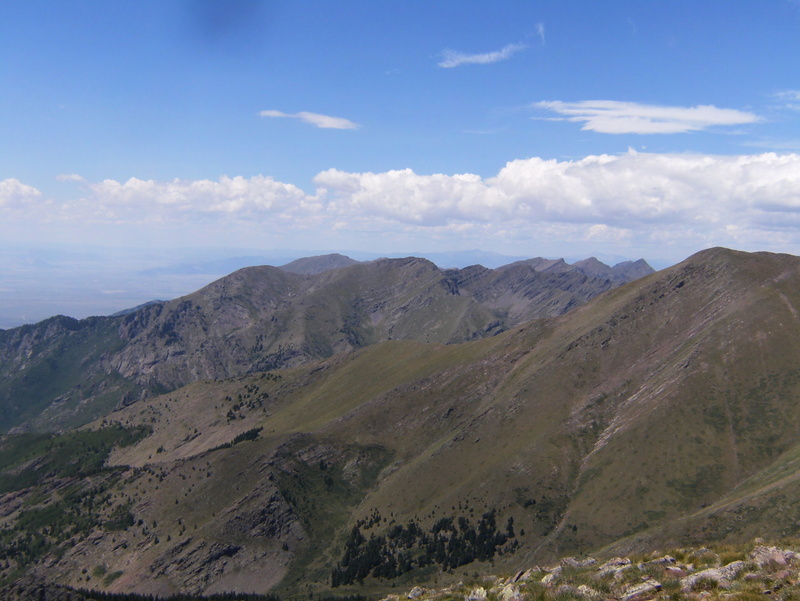 Approaching Comanche Peak. We begin to see the steep grassy slope on the back side. 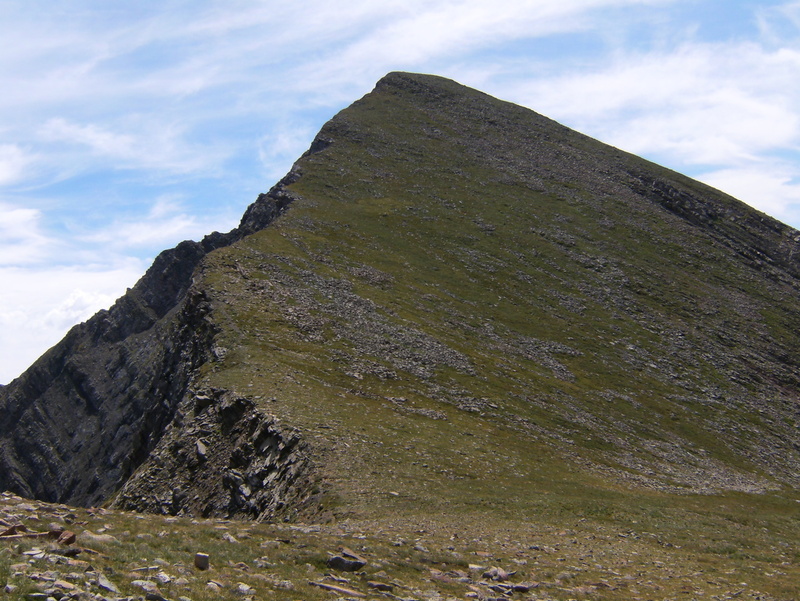 Venable Peak to the north, with the west face of Spring Mountain on the right. 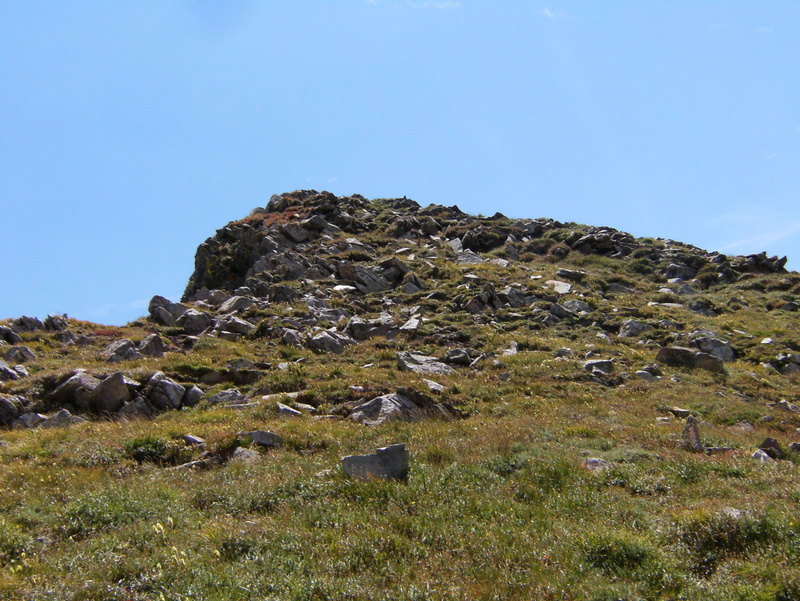 The trail goes from here over to the saddle below Venable Peak. 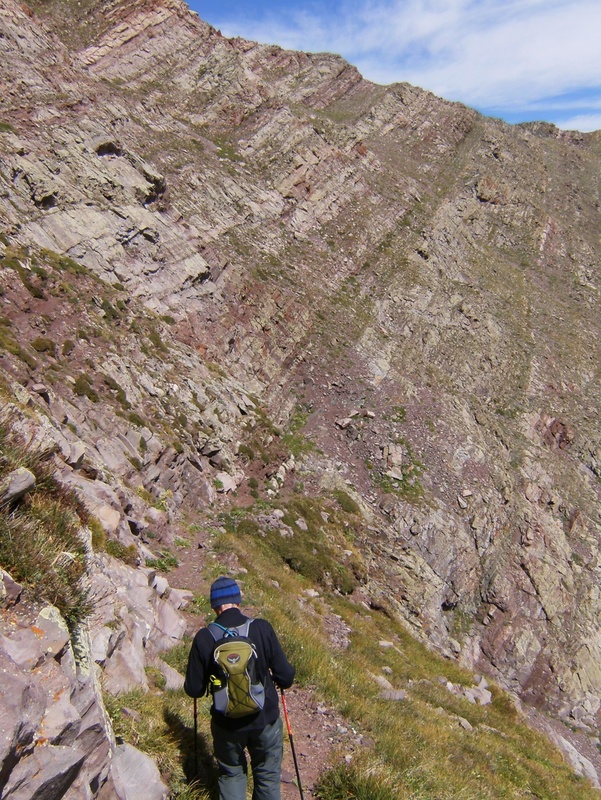 A look back at the Phantom Terrace approaching the saddle. You have to watch your step here. 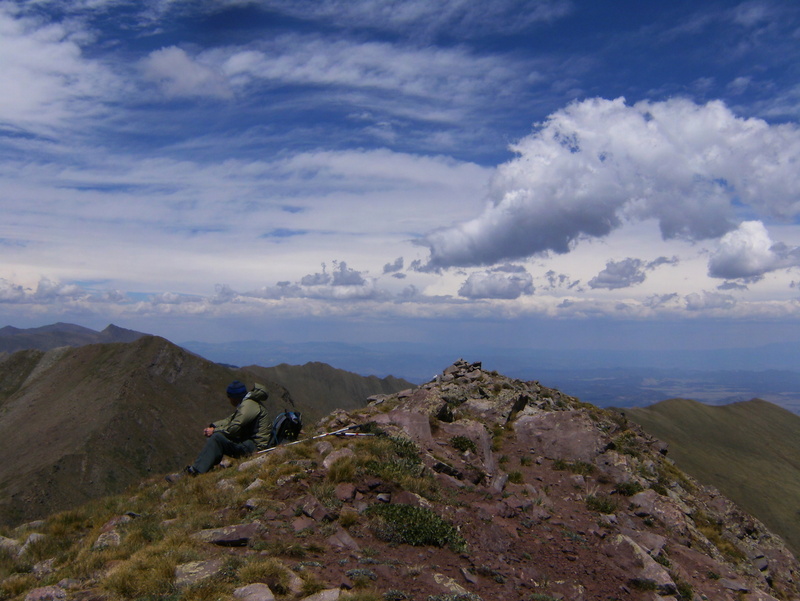 After a bit of lunch and rest we felt there was enough time before the afternoon storm so we started-up what looked like an impossibly-steep slope. 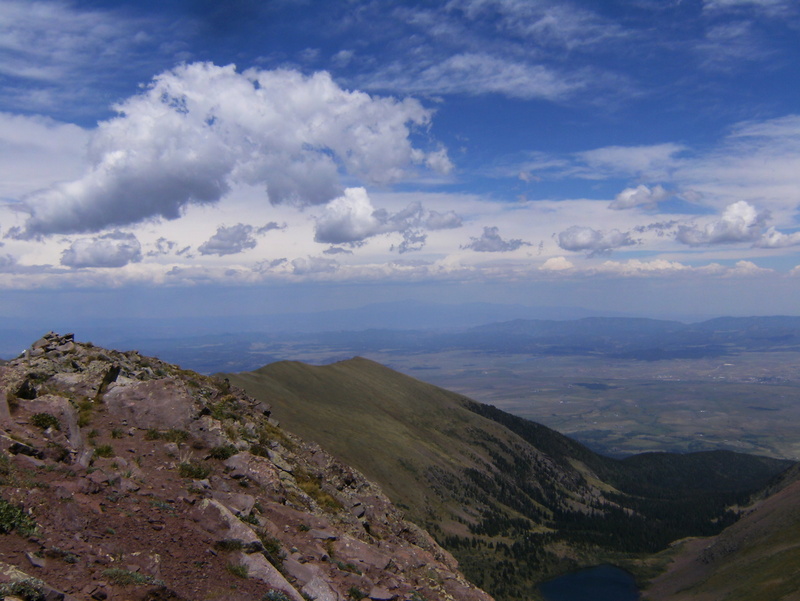 Back at Comanche Peak. 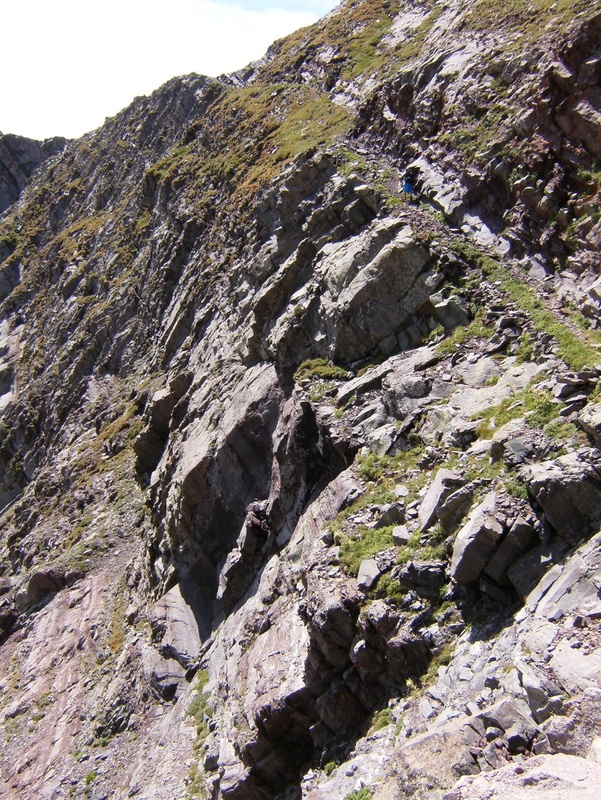 It seems impossibly steep, but we’ve decided to climb it. 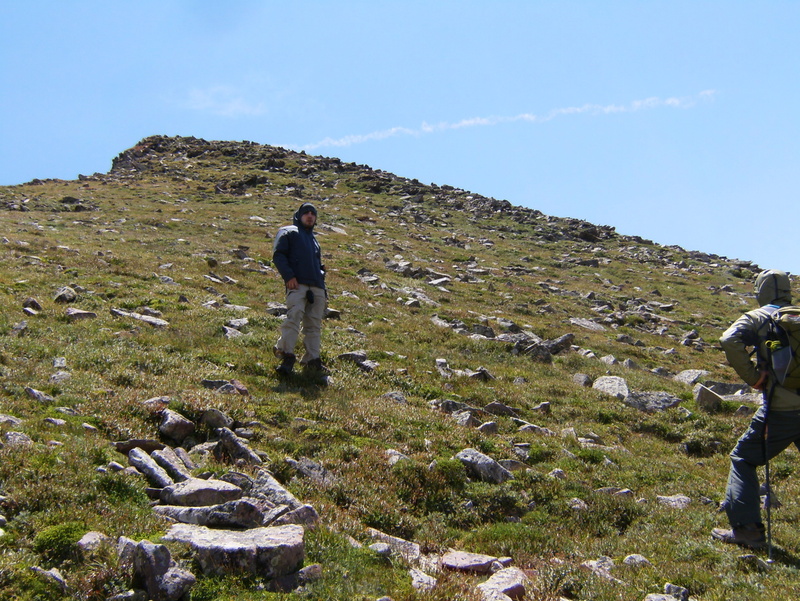 It’s a scramble up about 500 feet to the peak at 13277′ but we both eventually made it. It sure was a lot of work for a couple low-landers. 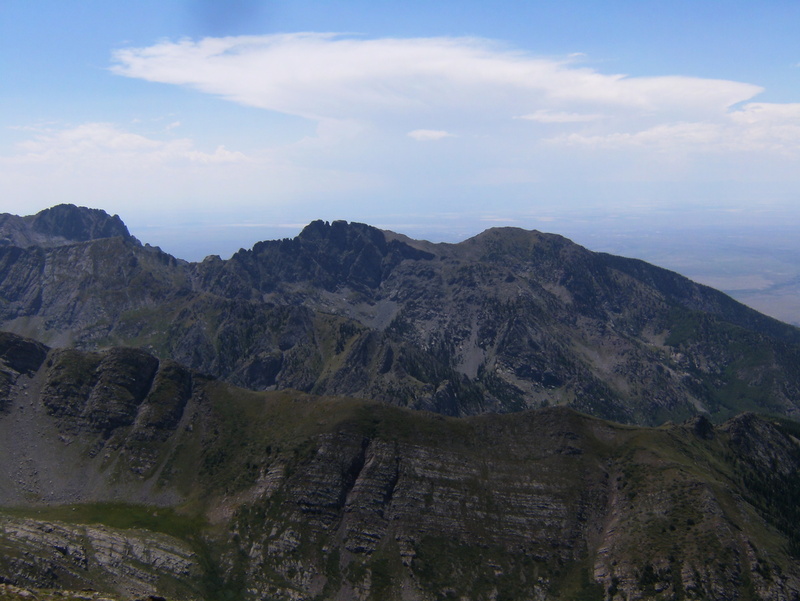 Here’s a series of pictures showing the view. 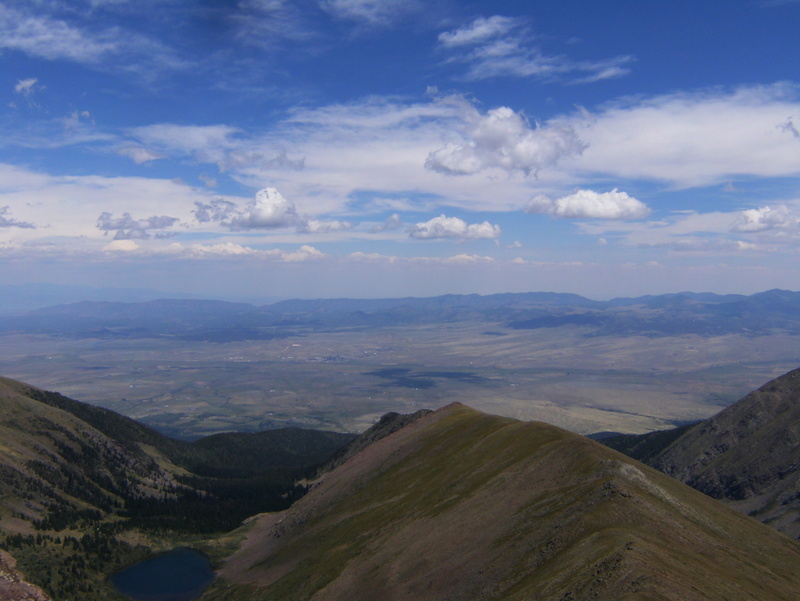 Starting out looking east towards Westcliffe and proceeding to the south, west, north, and back east. 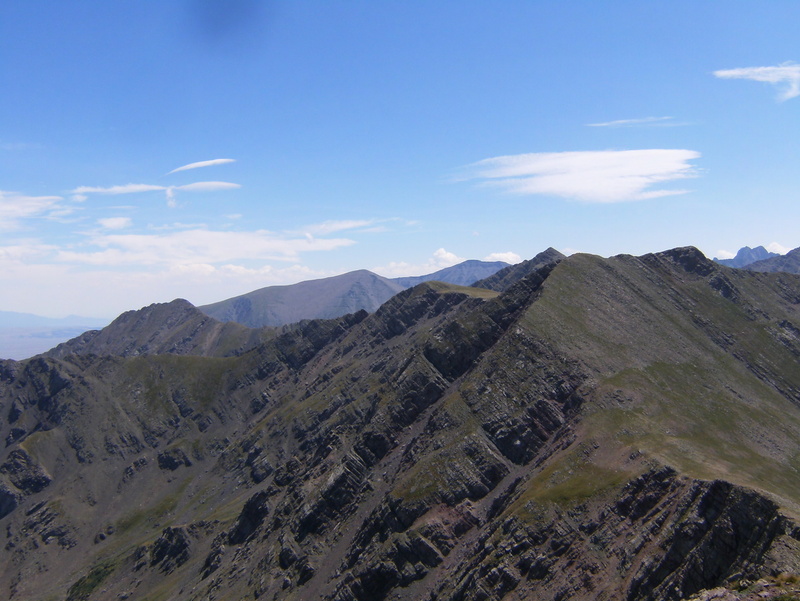 There are many other 13er’s in the area and a couple of Colorado’s toughest 14ers too. We were pretty pooped by the time we got back to camp and, as expected, it started raining shortly after. It only lasted 5-10 minutes this time. There was a pot of gold at the trail head but someone else apparently got to it first. 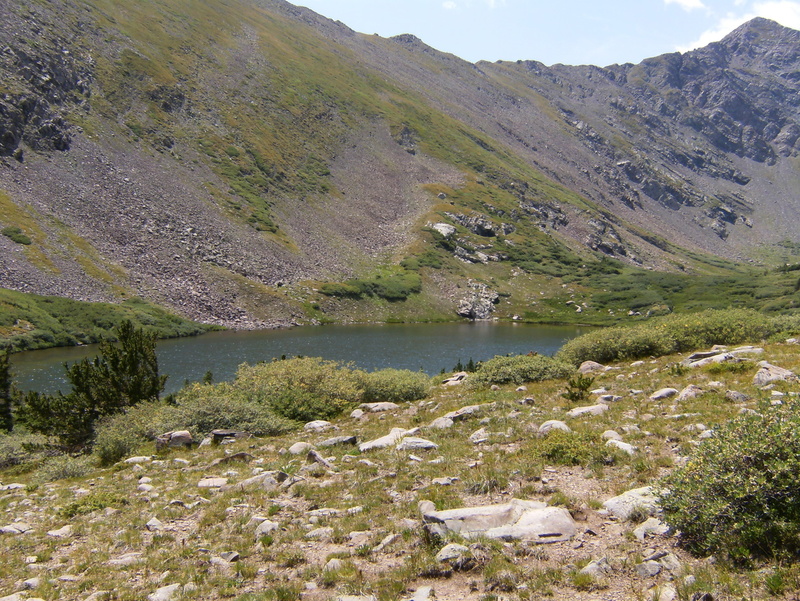 We went to the lake and refilled our water bottles, sat around for a while, ate dinner, and sat around some more. I went to bed at about 7:30 and slept pretty good until about 4:30 AM. After breakfast we packed and hit the trail at about 8:15, made it back to the trail head about 10:45 and headed home. We didn’t get back to KC until after 11:00 PM and I didn’t get to bed until about 1:00 AM. That sure made for a fun day at work Monday. It was a very enjoyable trip and a successful one too. 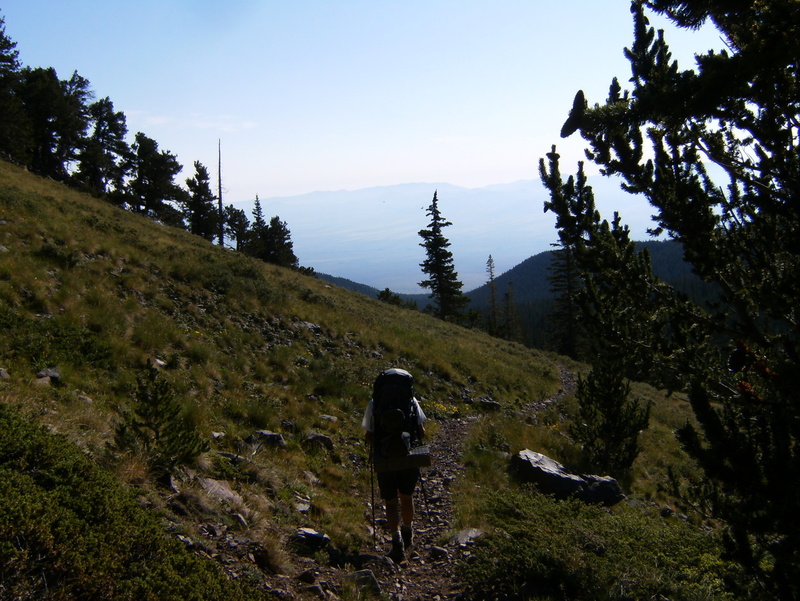 My first mountain backpacking trip has been checked-off the list. 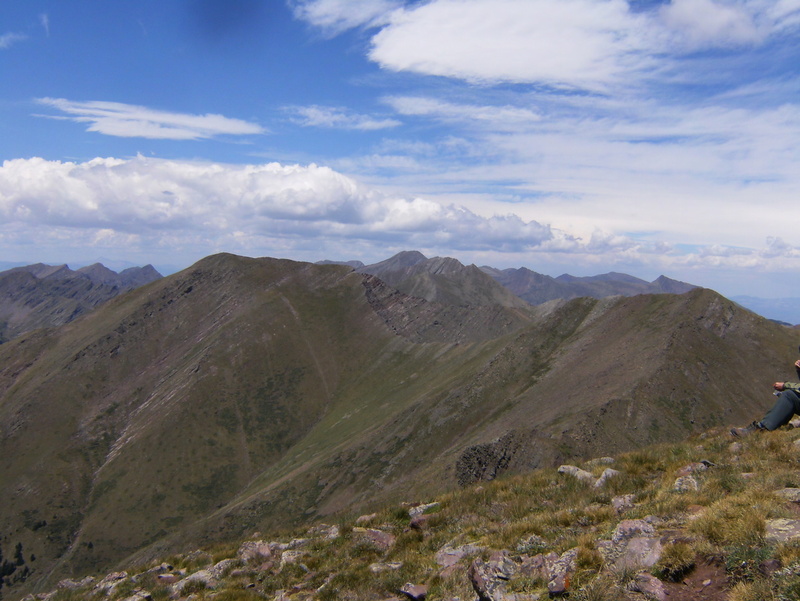 One goal that remains is to get somewhere remote enough that it can’t be reached on a day hike. That one might be checked-off pretty soon. 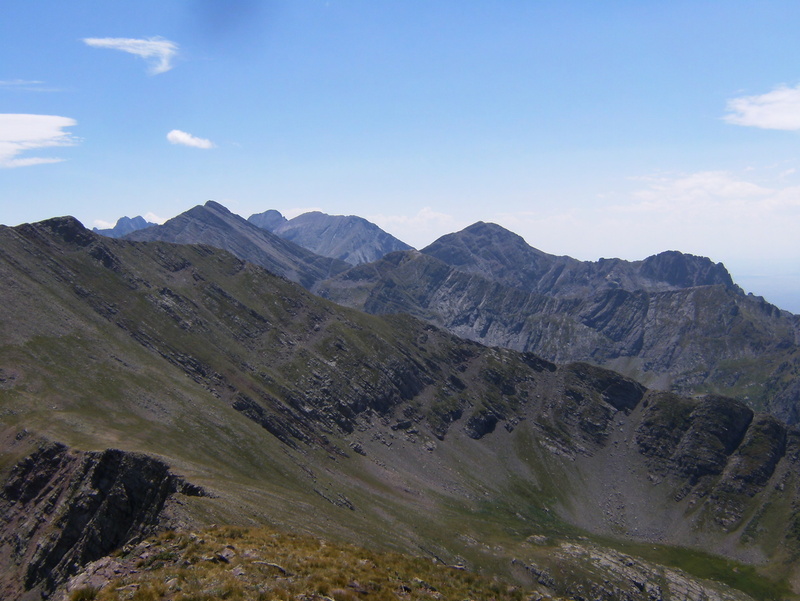 This entry was posted in Uncategorized and tagged Colorado, Hiking, Rocky Mountains, Travel. Bookmark the permalink.